A very sad news for the music industry. The King of Pop, Michael Jackson died on June 25th 2:26 P.M. (Pacific Time) at the age of 50. According to reports, Michael Jackson collapsed that morning at his home in west Los Angeles. The Paramedics responded to the 911 call at 12:21 P.M. (Local time). At the time the paramedics arrived, the music icon was not breathing. He then fell into a coma and died after being rushed to the UCLA hospital. The cause of death is suspected to be cardiac arrest. The LAPD though have opened an investigation to his death. Prior to his death, The King of Pop is scheduled to perform on 50 sold-out concert dates from July 13, 2009 to March 6, 2010. According to the President and CEO of AEG Live, Randy Phillips, Michael Jackson would have earned approximately £50 million for the first 10 days of concert. 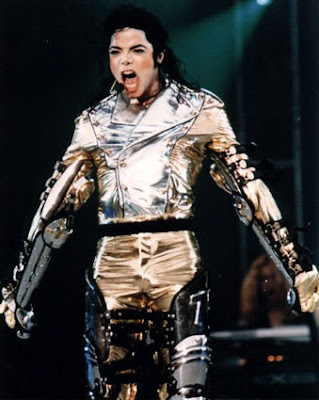 Michael Jackson has 10 studio albums, 17 compilation/greatest hits albums and a whopping 13 number one songs. The albums Off the Wall (1979), Thriller (1982), Bad (1987), Dangerous (1991) and HIStory (1995) are among the world's best-selling records. this is very shocking news..may his soul rest in peace. well puro sad news about michael jackson..but thanks to his contribution in the music industry. Anyways, Im asking a favor bro for you to consider Jologs Na Yuppie in your list of Top 10 Emerging Influential Blogs of 2009.
thanks for your advance support bro!